The 49ers' win over the Seahawks on Sunday gave Richard Sherman his first win against his former team. Sherman and Seahawks DE Frank Clark have exchanged some verbal barbs in the last couple of weeks, but there's no bad blood, they say. SANTA CLARA, Calif — When asked what it meant to beat Seattle for the first time as a 49er, former Seahawk Richard Sherman responded with a 214-word answer. “It means a ton,’’ began Sherman, which was all he really needed to say. 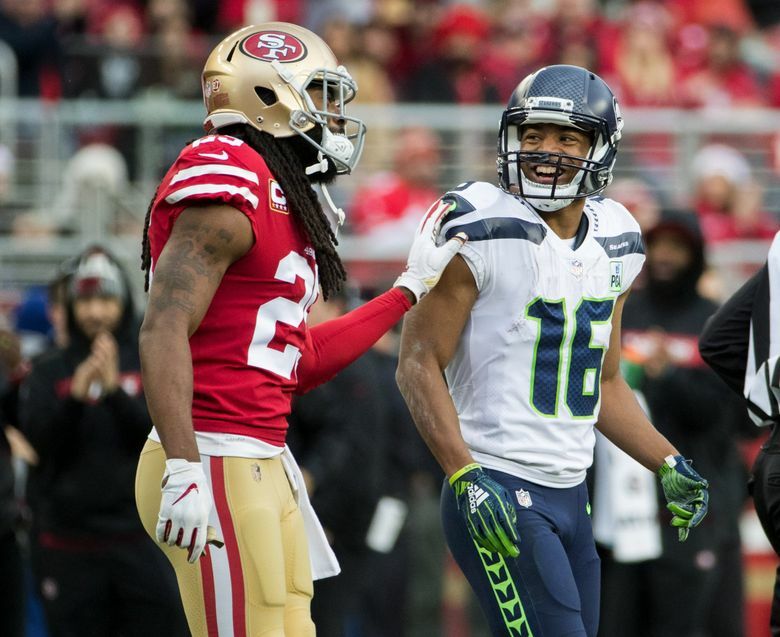 Undoubtedly, the 49ers’ 26-23 win over the Seahawks resonated with Sherman as much as it did any player on the field. Nowhere in Sherman’s answer did he mention Seahawks defensive lineman Frank Clark. Much was made during the week of Clark’s comments following last Monday’s win over the Vikings in which he said that Sherman’s era was over, and he was the leader of the Seattle defense now. Clark gave that answer when asked to address a comment Sherman made before the game about the Seahawks being a “middle of the road’’ squad. Clark said he talked quickly to Sherman after the loss and that all was good between the two players who were teammates for three years. Clark said the two had a brief interaction following the game that confirmed to him that all was good between them. “I smacked him in the back at the end of the game, just let him know I was there,’’ Clark said. “Had to let my OG know he was still an old man, didn’t want to smack him too hard and make those old bones crumble. “But we were just laughing because we got a great relationship, like I’ve been saying. What is said is said and what is the truth is the truth and at the end of the day we are just out there competing. Sherman, though, really seemed to like beating the Seahawks. One of the Seahawks’ most iconic players, his homecoming two weeks ago seemed friendly, with Sherman making the pregame rounds to say hello to former teammates and team staffers. This game, on Sherman’s new home turf, seemed more businesslike. If there were hugs this time, they were quick. Asked if the loss in Seattle had been frustrating, Sherman said yes. “I think the moment and the environment was a little bit much for young guys,” he said. Asked if he thought the Seahawks might possibly have overlooked the 49ers, even with his presence on the other sideline, Sherman said no. “I highly doubt it because just like I’m pretty inflammatory on the other side,’’ Sherman said, “I’m pretty inflammatory on both sides. My truth isn’t always everybody’s truth. … I highly doubt (Seattle coach) Pete (Carroll) is overlooking any time that I’m playing, and Russell (Wilson) as well.